TL: DR: GovTech’s approach to digitalisation is not just technology for technology’s sake, said chief executive Kok Ping Soon. Instead, it involves a fundamental re-think of the government-citizen relationship. The goal is to go beyond providing frictionless services to delighting citizens. These days, you can apply for a new passport, file your taxes and renew your library books all from the comfort of your home—or even on your mobile phone. 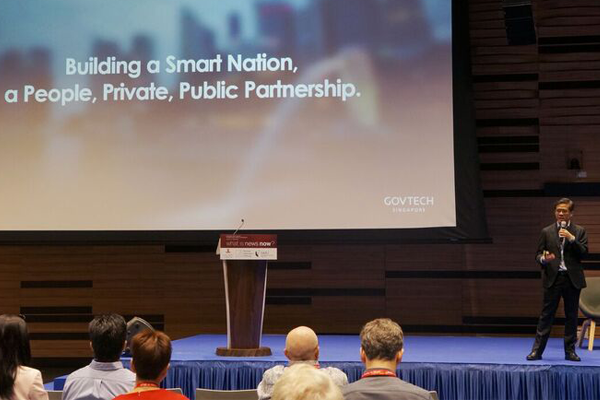 One of the reasons all this is possible is that the Singaporean government has been committed to digitalisation since the 1980s, explained Government Technology Agency of Singapore (GovTech) chief executive Mr Kok Ping Soon. “We have services that are well-acknowledged to be among the most comprehensive and responsive [in the world]; but we want to do even more,” said Mr Kok, speaking at the East-West Centre’s International Media Conference held at Singapore Management University from 24-27 June 2018. For GovTech, “more” doesn’t mean simply chasing the latest technology fads or spicing up press releases with trendy buzzwords. Instead, going digital requires a completely different approach, one that radically alters the relationship between the government and its citizens, Mr Kok said. In the past, digital services were thought of as a “linear value chain” that began with policy formulation and ended with technology implementation, Mr Kok explained. Singapore’s 16 different ministries and 84 agencies were organised accordingly, with structures that facilitated the flow from policy makers to operational staff who design a project’s specifications and finally to technology suppliers in charge of building the system. But citizens do not interact with the government in such a linear fashion. A new mother, for instance, would need to register her child’s birth, apply for the Baby Bonus scheme and access her child’s immunisation and medical records, services that would require her to approach three different government agencies: the Immigration and Checkpoints Authority, the Ministry of Social and Family Development and the Health Promotion Board respectively. With the Moments of Life (Families) app launched in June 2018, all this and more can be done within a single app instead. Apart from helping parents to register the birth of a child and apply for the Baby Bonus scheme with a single form, the Moments of Life (Families) app also allows them to locate nearby childcare centres, as well as check how full each centre is. The app is just one example of how the government has re-organised itself and integrated services around the needs of its citizens, Mr Kok said. As the name suggests, the moments of life approach will be extended to non-parents as the government continues to re-think services from the perspective of its citizens. Another thing that the government is now doing differently is getting citizens involved as early as possible, partnering them to co-create new services rather than simply collecting feedback after the service has been launched. “It used to be that when we delivered digital services, citizens were the subject of study. We did focus groups to find out their needs and develop services for them. Citizens were involved, but somewhat downstream [in the process],” Mr Kok said. Co-creation has proven to be a productive approach, particularly in the realm of transportation. For example, GovTech’s Beeline app makes public transport data available to private bus operators, allowing them to crowdsource demand for point-to-point bus services and adaptively plan their routes. Ultimately, digitalisation should be about treating the citizen as a customer and providing services that do not just satisfy but actually delight them, he added. “If we can deliver services that are easy to use, seamless and secure online, all we have done is reduce the inconveniences [of everyday life]. But doing more to delight citizens might be foreign to governments because unlike private companies, we are not trying to maximise revenue,” Mr Kok said. Nonetheless, it is essential for governments to embrace the “law of the customer” and focus on the needs of its citizenry, he said. To do this, GovTech starts developing new services by first going through what it calls a ‘service experience journey,’ evaluating every interaction with the government from the perspective of the user.